A year after the outbreak was officially declared, the virus has killed more than 10,000 people. The medical charity Medecins Sans Frontieres says a "global coalition of inaction" led to tragic consequences. Looking back over the year, the charity suggests its early calls for help were ignored by local governments and the World Health Organization. 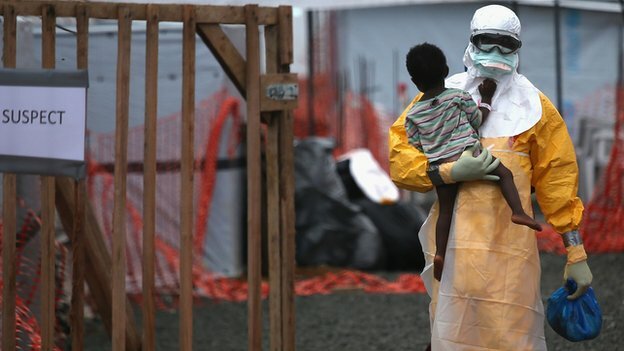 The head of the UN Ebola response mission told the BBC, when the virus first struck, "there was probably a lack of knowledge and there was a certain degree of arrogance, but I think we are learning lessons. "We have been running away from giving any specific date, but I am pretty sure myself that it will be gone by the summer." The first person to succumb to the disease during this outbreak is thought to have been a toddler in a remote part of Guinea. He died in December 2013. Three months later the WHO officially announced an outbreak. And it was a further five months before the organisation declared it a public health emergency of international concern. At this point more than 1,000 people had lost their lives. Henry Gray, MSF emergency coordinator, told the BBC: "We were well aware this was something different in March and April last year and we did try to bring this to the attention of the WHO but also governments within the countries affected. "And of course it was frustrating that we weren't heard and that has probably led to the scale of the epidemic we see today." The charity says it should also have used more of its own resources earlier in the crisis.